David Cameron has promised that, if re-elected in the 2015 general election, he will renegotiate Britain's relationship with the EU before putting it to a referendum in 2017. However, so far there has been little indication of what sort of deal he hopes to strike. 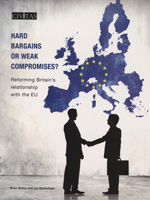 In this timely and wide-ranging study of the UK's position in Europe, Conservative MP Brian Binley and academic Dr Lee Rotherham appraise the options for reform and begin to set out the course of action the Prime Minister must get to grips with - and quickly. Much closer analysis must be undertaken of the pros and cons of British membership of the EU, they argue, and David Cameron must establish his red lines before embarking on negotiation. Ranging across the gamut of EU competences - from free movement of labour rules to the Common Agricultural Policy, from social and employment legislation to the threat to the City - Binley and Rotherham unpack the arguments and show where policy-making can and must be returned to the Westminster parliament. They weigh the merits of some of the leading proposals for disentanglement and sketch out their own vision of a relationship between the UK and the EU which benefits Britain, by maintaining trade ties while keeping interference from Brussels to a minimum. The Prime Minister himself has noted: 'The biggest danger to the European Union comes not from those who advocate change, but from those who denounce new thinking as heresy.' Binley and Rotherham here make an essential contribution to such new thinking as they seek to ensure that Britain is not held back by timid considerations of its role in the world. They demonstrate that only fundamental reform will do; minor tinkering might just be enough to win a referendum in 2017, but it will only be counter-productive for all involved over the long term.